The breathtaking landscape of štajerska slovenija with its alpine-mediterranean climate has been producing white wines of international renown since the imperial period. 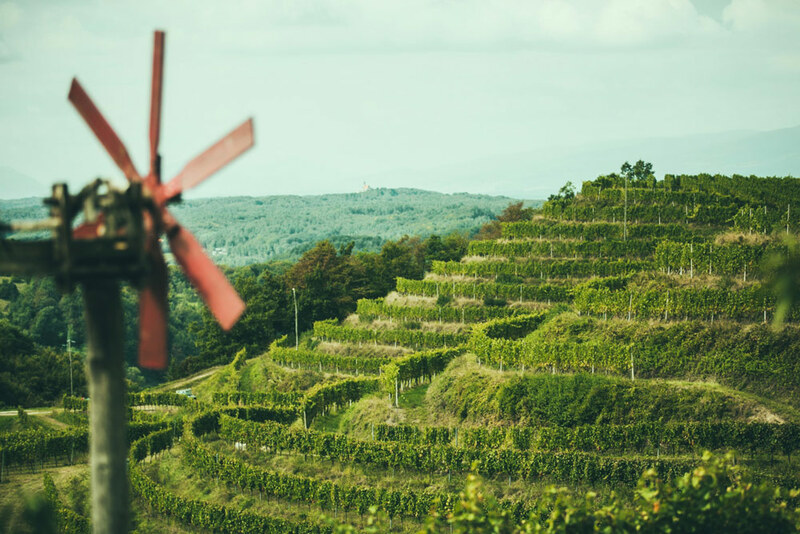 Right at the heart of the viticultural area of Štajerska Slovenija is Gorca, a wine-growing village surrounded by the most charming landscape you can imagine: a dense mesh of hills with bowl-shaped terraced vineyards to manage the steep terrain. The highest vantage point offers breath-taking views across our vineyards, reaching as far as the borders with Austria and Croatia. A sleeping beauty for over a hundred years, still largely off the beaten track, the winegrowing area of Štajerska Slovenija is now slowly waking up to a new destiny. Wines from this region were once enjoyed at the royal tables of the Danube Monarchy, a sure sign of their potential for excellence. and planted some anew. 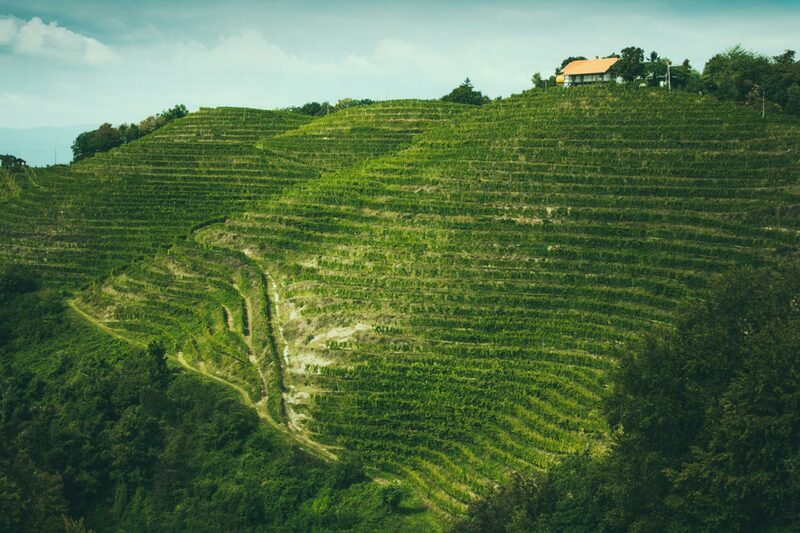 Our Slovenian vineyards meanwhile make for nearly a fifth of the surface area cultivated by our winery. Having vineyards on the other side of the border is not entirely new to our family. Our first vineyard from 1907, the Witscheiner Herrenberg, is today located on Slovenian ground. For generations, we have been growing wine in two viticultural areas that are similar in terms of soil, climate, and landscape cultivation. We commit ourselves to contributing to the rapprochement of the two regions and to helping restore Štajerska Slovenija to its ancient fame. Pioneering spirit and manual labour is a must in the steep, terraced vineyards of the gorca region. The calcareous soils and a climate influenced by the Alps and the Adriatic Sea are closely related to Südsteiermark. 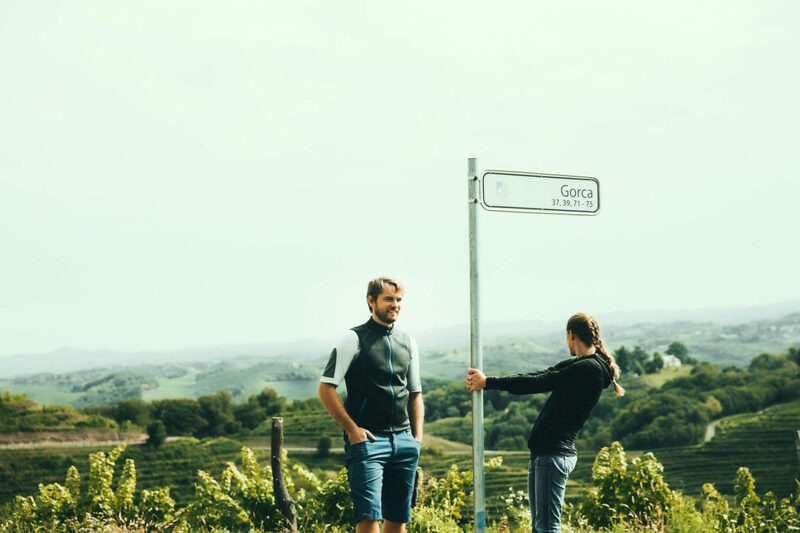 Gorca, around 60 kilometres south of the Austro-Slovenian border, offers ideal conditions for growing excellent Furmint and Sauvignon Blanc. Viticulture on the steep and narrow terraces needs careful work, all by hand. The grapes are processed and the wines left to mature in the cellar of a vintner’s house located amidst the vineyards high up in Gorca. In 2011, we adapted the press house and vaulted cellar to our technical needs and brought our first vintage to the market: Colles 2011 was born. International media and sommeliers of renown have meanwhile discovered the virtues of the wines from this region. Together with local winegrowers, we are of course happy about this development. We spend much time in Gorca, work hand in hand with the locals, and appreciate the cooperation with the neighbourhood. Their positive feedback has encouraged us to continue with our pioneering work and make a name for the region well beyond its boundaries. Historically speaking, the winegrowing area of Štajerska Slovenija has always proven its potential for quality. Two world wars and their political aftermath have, however, left their traces. It is our ambition to wake Štajerska Slovenija from its slumber, with great passion and a good deal of work. Our Slovenian vineyards are located in the Haloze region near the town of Ptuj, around 60 km south of our winery. Terraced vineyards on steep hills characterize the scenery. Our grape vines grow in south-facing bowl-shaped sites. The calcareous clay soil or marl, as experts would call it, is referred to as “opok” in Südsteiermark or “opoka” in large parts of Slovenia. Winegrowers in Gorca simply call it “lapor” (Slovenian for marl), a name that we would also like to use. The humus-bearing topsoil layer is rather thin, which is why the grape vines are deeply rooted in the lapor, in search for nutrients. This is reflected in the wines: lean, by no means opulent or fruit-forward, salty, and with a long-lasting finish. The climate in Štajerska Slovenija resembles ours in Südsteiermark. Both areas are influenced by the Alps and the Adriatic Sea. Warmer days and cool nights characterize their aromas. The only difference: it rains much less in the wine-growing village of Gorca, with an annual average precipitation of 600 litres/sqm (in Ratsch we have 1 000 l/sqm). The air in the bowl-shaped sites of Gorca is also much warmer as the sides of the terraced hills reflect the heat. In 2004 Alois Gross received a hand-written letter with an offer to purchase a small house and vineyard in the viticultural area of Gorca, Slovenia. The seller, an elderly woman in Vienna, wanted to make sure that her family’s possession passed into good hands. Alois saw no need to enlarge his winery by another vineyard 60 km away and first did not respond to the letter. When a postcard arrived from the same sender a few weeks later, they agreed to go and have a look. Their destination was some ten km south of Ptuj in an extremely charming landscape. On a little hill, at the end of the road, was a vintner’s house surrounded by grape vines. Enchanted by the little estate and its surroundings, Alois decided to spend more time there in the future. A little later, the neighbours contacted him: two groups of heirs with up to 27 legal successors, none of whom had anything to do with wine, also wanted to sell. When Johannes and Michael first visited the region, they saw its potential right away. They planted new vineyards, replaced the dead vines, and learned to work with the existing terroir and its fruits. Seven years after their first trip to Gorca, they launched “Colles 2011”, their first wine from the area. This viticultural area was once known as “Kollos”. The name goes back to the Imperial period and was derived from “Colles”, a hilly wine land. The young Sauvignon Blanc vines were given ideal conditions to take root in the hard subsoil of the terraced vineyards. We planted them 50 cm deep in holes that we drilled using an earth auger and then filled with organic humus rich in nutrients. After Welschriesling (Laški Rizling), Furmint is the second-most planted grape variety in Slovenia. It is also known as Šipon, a variety that has been taken to great fame in Hungary with its famous sweet wines from Tokaji. In 2008 Johannes and Michael Gross paid a visit to István Szepsy, the pioneer of dry Furmint, in order to buy a selection of his best grape vines. They bred the vines and planted them on the terraces in Gorca.